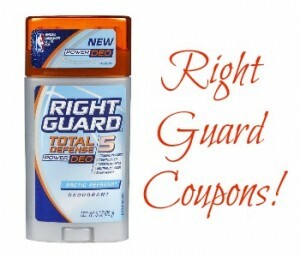 Home > Printable Coupons > Right Guard Coupons | Deodorant $1.50 at Walgreens! Right Guard Coupons | Deodorant $1.50 at Walgreens! These two Right Guard coupons are back! If you didn’t have a chance to print them before, now is your chance. And you can pick up Right Guard deodorant for just $1.50 at Walgreens this week!